the percentage of women by title and by industry. women in the CEO and CHRO roles remained constant. as CEO. This percentage is the same as last year. with the lowest percentage of women CEOs is healthcare at 1 percent. Stevenson, Global Leader of Korn Ferry’s CEO Succession Services. 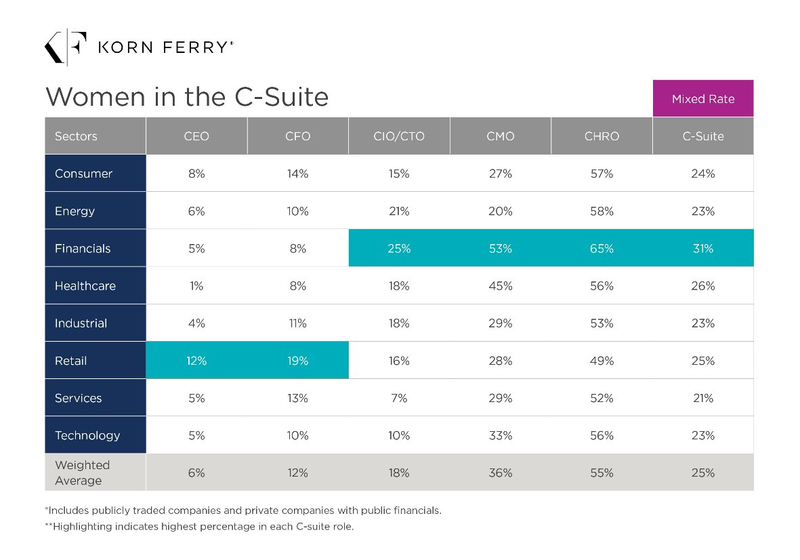 Proctor, Korn Ferry Global Financial Officer Practice Leader. is in services at 7 percent. percent last year) and energy has the lowest at 20 percent. Kaplan, Korn Ferry Senior Client Partner in the CHRO Practice. members in the industrial, technology and energy industries are women. The services industry comes in last at 21 percent.